This post is mathematical in nature and wholly unoriginal. All it does is walk through the algebraic relationships between BA, OBA, SLG and some other related metrics, with a little bit of my commentary sprinkled in. I believe there is nothing here that I haven’t written about before, let alone others, but I thought it would be nice to have it all in one place for easy reference. There is also a certain quickie method that involves two of the big three slash stats (other than OPS!) that drives me nuts, and occasionally I feel compelled to fire off a missive against it. I will assume here that BA = H/AB, OBA = (H + W)/(AB + W), and SLG = TB/AB--in other words, ignoring the presence of HB and SF in the OBA formula. If you prefer, just think of HB as being combined with walks in a single category, so that walks in the formulas actually represent W + HB. Since they are essentially the same and none of the metrics here draw any distinction between them, such treatment won’t cause any distortion and will clean up the clutter. Sacrifices are a mess, but don’t have a major effect in any event. This post would look much better with numerators written over denominators, but it is so much more time effective to just type everything out. You don’t see OBA - BA used in many formal situations, but it is sometimes used as a quick indicator of plate discipline. It’s easy to see why people might use it that way--it resembles isolated power, and since it is walks that cause OBA to differ from BA, it seems fairly sensible. In other words, OBA - BA is walk rate times outs/at bat. This chart shows OBA - BA for three walk rates at four different BA levels. As you can see, the lower the BA, the higher OBA - BA is for a given walk rate. The distortion increases as walk rate increases. The differences are not enormous except for extreme cases, but they’re still plenty large enough for me to avoid using OBA - BA as a stand-in for walk rate in any circumstance. Some people may object to my discussion here and counter that OBA - BA is not intended to be a measure of walk rate so much as it is a measure of the amount of on base ability the player brings above and beyond his batting average. My objections to this position are many, but one that deserves mention here is that it is a position that starts with the inferior, less fundamental statistic (BA) and attempts to build up to the statistic that pretty much defines a fundamental baseball measure (assuming runs and wins are off the table). Being forced to use OBA - BA to measure “additional” on base ability just points out the folly of making BA the building block rate in the first place. 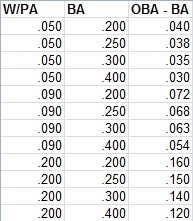 The ratio of walks to at bats is not a particularly meaningful ratio, but it will produce the same rank order list as walks per plate appearance given the assumptions of this post (ignoring SF and treating HB as zero or walks, walks per plate appearance by definition would simply be W/AB divided by itself plus one). It is also a component of secondary average, and it’s instructive to see how it can be pulled out of OBA and BA. So if you want an acceptable (in that it orders players by the frequency with which they actually draw walks) stand-in for walk rate from OBA and BA, you can just figure (OBA - BA)/(1 - OBA). But there’s an equally easy way to get to the more useful and properly denominated walks per plate appearance. So please scrap the silly, unitless, distortive OBA - BA and replace it with (OBA - BA)/(1 - BA), which actually is walk rate. The 2011 Indians were not expected to do much; even within the organization, 2011 was likely viewed as a transitional year, with the goal of sorting out some nagging questions about the major league roster (Will Carlos Santana and Grady Sizemore be able to return from their injuries? Can Justin Masterson be an effective stating pitcher? Will Matt LaPorta ever amount to even a small fraction of his potential? Will Fausto Carmona ever come close to matching what he did in 2007?) and breaking in some younger talent as the season went along (Alex White, Lonnie Chisenhall, Jason Kipnis). Minnesota, Chicago, and Detroit all seemed to be better clubs on paper. Instead, the team started 30-15 and built a relatively sizeable lead in the American League Central, making 2011 a surprise contention season. Of course, the team was not as good as their gaudy start, and while Chicago and Minnesota never recovered, Detroit came on strong as the summer progressed. Still, the Indians made moves that were consistent with a team that fancied itself a real contender. They promoted Lonnie Chisenhall to try to inject some life into a slumping offense, despite the fact that he wasn’t really tearing up AAA. They appeared to dabble in the trade market, being linked to names like Carlos Beltran and Josh Willingham, but given the organization’s historical reluctance to pull the trigger on a major deadline deal, even in seasons when they were real contenders, this observer discounted the rumors. But on July 30, the Tribe jumped into the trade game, sending three of the organization’s top pitching prospects to Colorado for Ubaldo Jimenez. It didn’t do any good--Jimenez was terrible for Cleveland, and a three-game sweep at Comerica Park August 19-21 (including an excruciating 8-7 loss in the finale, a game started and seemingly lost by Jimenez before a valiant comeback effort) put the Indians 4.5 back; they’d never get closer and wound up 80-82 and fifteen games out. The Indians were aggressive at the deadline, but mostly passive in the offseason while Detroit went out and signed Prince Fielder, a move which greatly diminished any residual optimism about Cleveland’s divisional hopes for 2012. The Indians will once again go with the duo of Carlos Santana and Lou Marson behind the plate. Santana will also see time at first base and DH, although perhaps less than he may have initially seemed in line for as the Indians signed Casey Kotchman. It is quite possible that Santana will play first against left-handed pitchers, as Kotchman’s career platoon OPS split is 754/668. In Marson’s 199 PA against lefties, he has posted a 763 OPS, so it seems likely the Tribe will hope that even with some platoon split regression, Marson will be an asset. At second base, Jason Kipnis will be handed the starting job after an impressive power display in his first 150 major league PA. Kipnis’ track record would indicate that his production should be tilted less towards power and more towards getting on base than it was in Cleveland, but he has the potential to be an offensive plus at the keystone. Third base will be an open competition between Lonnie Chisenhall and Jack Hanahan. Hanahan was the opening day starter in 2011 and actually was a league average hitter (albeit fueled by a hot April) in addition to playing excellent defense. However, with the offense faltering in late June, Chisenhall was recalled and given a chance to take over the position. Poor strike zone judgment (8/49 W/K) held back his production, and Chisenhall hadn’t exactly been tearing up AAA prior to his promotion (.267/.353/.431 in 292 PA). Chisenhall will have to perform extremely well in the spring to win the job, and my money is on Hanahan. Asdrubal Cabrera will return at shortstop after a season that included some great highlights. A surprising power surge early in the year plus several spectacular web gem plays ensured that his season would be remembered in Cleveland. While defensive metrics may dispute his fielding prowess and he’s no offensive star, there aren’t many AL shortstops I’d prefer. The outfield consists of three question marks. In left field, it remains unclear if Michael Brantely can hit at an acceptable level to be anything more than a fourth outfielder. Playing him in left field is suboptimal, and there was even idle talk of giving him some time at first prior to the Kotchman. In center, Grady Sizemore returns on a one-year deal. Upon Sizemore’s return, there was a brief period in which he looked like the dynamic player he had been from 2006-08. Sadly, Sizemore was again bogged down by injuries and his once outstanding walk rate was nowhere to be found (18 walks in 295 PA and a .285 OBA). It will be interesting to see whether Brantley or Sizemore leads off. My guess is that Sizemore will start in the position but be on a short leash. In right, Shin-Soo Choo seemed poised for another big year with his exemption from the Korean military secured. Instead, he got off to a slow start, was arrested for DUI, and suffered a broken thumb when hit by a pitch in San Francisco. DH Travis Hafner was productive when in the lineup, but again without the power he once showed (just 13 home runs). Marson will be the backup catcher, but there are no locks for the rest of the bench. If Chisenhall wins the third base job, Hanahan is a good bet as a corner backup; if not, Chisenhall will go to Columbus. Russ Canzler, Shelley Duncan, and Andy LaRoche are corner backup options, with Jason Donald, Cord Phelps, and Jose Lopez as potential middle infield backups. Donald would seem to have the edge as he at least masquerades as a shortstop, and Hannahan would be the only other player on the roster (besides Cabrera, of course) remotely qualified to play short. Aaron Cunningham, Fred Lewis, Felix Pie, and Ryan Spilborghs are possible outfield reserves. Matt LaPorta will likely be ticketed to AAA with the Kotchman signing. The Indians will try the interesting pairing of a groundball heavy rotation with infield defense which is considered less than brilliant. Justin Masterson had a terrific season, justifying Cleveland’s faith in his ability to start. Ubaldo Jimenez must pitch better than he did in 2011 to prevent the trade from going down as a disaster, and the Indians will bet that Derek Lowe’s peripherals will triumph over his advancing age and poor 2011. After that, Josh Tomlin is a good bet for the rotation (and a good bet to implode at any given moment, given his low strikeout rate and flyball tendencies. Any spike in his walk rate, which was just 1.1 per nine in 2011, will endanger his ability to pitch in the majors). With Roberto Hernandez Heredia nee Fausto Carmona unavailable for the start of the season, the fifth starter spot will be up for grabs between Kevin Slowey, Jeanmar Gomez, Zach McAllister, and David Huff. Slowey’s experience may give him the upper hand, but the other three are all well-known by the organization and have started for the team in the past. Slowey has a decent chance to win a bullpen job if he’s shut out of the rotation. Additional depth comes from lefty Scott Barnes, but after missing a good chunk of last season with a knee injury he is likely to start in Columbus. The Indians seem to have the foundation for a solid but unspectacular bullpen. Chris Perez is a power arm but a shaky closer, while Vinnie Pestano had a very effective rookie season as his set up man. Rafael Perez and Tony Sipp both are used in a more expansive role than simple LOOGY. Joe Smith serves the ROOGY role with his sidearm delivery. The other two bullpen spots are up for grabs, with Frank Herrmann and lefty Nick Hagadone as the 40-man roster options. Non-roster invitees Jeremy Accardo, Chris Ray, Robinson Tejada, Dan Wheeler, and Chen Lee will also be in the mix. I would like to be optimistic about the Indians 2012 season, but I can’t force it. Detroit is the class of the division, and it would take a lot going wrong for the Tigers and right for the Indians to wipe out the gap. While many people will pick the Indians to reprise their second place finish, they don’t tower over the White Sox on paper, and both the Twins and the Royals have enough potential areas for improvement that it’s not hard to envision them jumping Cleveland. My median expectation is 77 wins and third place, with a nagging feeling that it will be worse than that. Personally, a lot of my confidence in the organization was shaken by the Jimenez trade. While there is a case to be made that 2 1/3 years of control of Jimenez at a reasonable salary is worth the package of pitching prospects the Tribe surrendered, it wasn’t the kind of deal that the organization has made, even with better teams in more of a win-now mode. Had the trade landed a pitcher at the top of his game I might have been inclined to shrug it off, but Jimenez was not having a particularly good season for the Rockies and has just one season in his career in which he has been a top-flight starter. Jimenez *looked* horrible with the Indians, unable to command his secondary pitches and getting crushed on straight fastballs in hitters counts. The Indians have a decent group of young position players in Santana, Kipnis, and Chisenhall (not to mention older players still under club control for multiple seasons like Cabrera and Choo), but frustratingly, the organization has been unable to produce any even league average performers at the corner positions (Choo was a trade acquisition). With production from first base and left field, one could feel pretty good about the offense. Starting pitching has been a similar stumbling block. With Alex White and Drew Pomeranz shipped out in the Jimenez trade, there is little hope for even a mid-rotation type of homegrown starter on the horizon. The Indians have produced scores of back-end starters but have relied on trades to fill out the front end of the rotation. Overall, I respect the front office: Mark Shapiro and Chris Antonetti, and of course I have a great deal of respect for the analytical arm which includes Keith Woolner and Sky Andrecheck. I consider Manny Acta to be a pretty competent manager and have been impressed by his thoughts on Twitter. I like them and I want them to be successful, but I don’t think it will happen in 2012. 2011 was the first season for Greg Beals as OSU coach, replacing the retired Bob Todd who served in that role from 1988-2010. It is obviously unfair to blame a new coach for everything that happened in his first year, but the facts must still be presented--the Buckeyes went 26-27, their first losing campaign since 1987. A couple of facts balance that--the team managed to go 13-11 in conference play and earn the #4 seed in the Big Ten Tournament, while the 2010 team failed to qualify for the tournament. And Beals played a more adventurous pre-conference schedule than had been the norm in the last decade or so of Todd’s career, including a predictably poor 1-5 trip through California. Still, Boyd Nation’s ISR ranking pegged OSU as #160 nationally, the program’s worst showing for the years (1997 on) for which the ISRs have been published (the previous low was #130 in 1998). The 2012 team will not look radically different than 2011. Junior Greg Solomon will serve as catcher and figures to get the overwhelming majority of playing time once again. Solomon hit will early in the season, but his horrific strike zone judgment (42/4 K/W) caught up with him and by the end of the season he contributed little to Ohio’s offense. Nonetheless, Beals rode his hot hand and had Solomon hitting in the middle of the lineup as his slump began. Apparently, Solomon may also see significant time at third base, where his bat will be a major liability, with true freshman Aaron Gretz taking over some of the catching chores. At first base, sophomore Josh Dezse will start. Dezse looks like a power hitter, but his main offensive contribution as a freshman came from a .332 BA (his SEC was only a respectable .280). The hope here is that Dezse will build on his Big Ten Freshman of the Year campaign and emerge as the true all-around batting star that OSU has lacked since Ronnie Bourquin. At second base, junior Ryan Cypret is a captain and a solid defender. His offensive game is BA-centric, but nonetheless figures to hit in the middle of the lineup. It is not clear who will play third as incumbent Matt Streng graduated. Junior Brad Hallberg showed no power (.042 ISO) and didn’t hit for average (.254), but led the team with 28 walks and showed more promise as a freshman in 2010. However, it appears as if Beals is more comfortable using Hallberg as the DH rather than at third base; in fact, one of Beals first major personnel decisions was to flip Streng and Hallberg from one corner to the other. With Hallberg as DH, true freshman Ryan Leffel or Solomon could man third. Four-year starter Tyler Engle is gone, leaving a gaping hole at shortstop which the Bucks plan to fill with junior college transfer (junior eligible) Kirby Pellant. Pellant played his freshman season at Marshall, then transferred to Chandler-Gilbert Community College, and is expected to bat second in the lineup. In the outfield, only one starter returns in the same position--sophomore Tim Wetzel will leadoff and play center field. Wetzel was another Buckeye who flashed no power (three doubles and two triples in 176 at bats), but a little improvement in his OBA would allow him to contribute in his role. Sophomore Mike Carroll, who sat out 2011 after transferring from Duke, will take over left field and will be expected to provide a jolt to the offense. That will allow the Buckeyes to shift senior David Corna from left to right. Corna was only an average offensive performer last year, with his team-leading 16 doubles the most impressive part of his game. Key reserves include Gretz (if he doesn’t break into the lineup as the regular catcher), Ryan Leffel at third, senior Brad Hutton as a 1B/DH/PH, redshirt freshman Phil Jaskot on the middle infield, and junior Joe Ciamocco and sophomore Blake Hutton in the outfield (corners for the latter). Freshman who don’t look to be in the mix include catcher Ryan Wonders and outfielders Austin Achter and Pat Porter (who incidentally hails from my hometown). On the mound, junior Brett McKinney should assume the role of Friday starter. McKinney was only average last season, but seems to have good stuff and is easily the most experienced starter on the roster. The Saturday assignment will go to Brian King, a junior-eligible transfer from Paradise Valley Community College. Baseball America rates King as the best newcomer to the Big Ten, so the lefty figures to have a big impact. Righty Greg Greve, who struggled mightily at the beginning of his freshman season but started to pitch better as the year went on, is slotted in as the Sunday starter. A pair of sophomore right-handers, John Kuchno and Jaron Long (a JUCO teammate of Pellant), figure to serve as the mid-week starters and could certainly push Greve for conference assignments. Junior Brad Goldberg, who transferred from Coastal Carolina a year ago, could get starting nods if he is able to get an eligibility situation resolved. Three key relievers return: junior righty sidearmer David Fathalikani, senior lefty Andrew Armstrong, and Dezse. Dezse will serve as the closer, but hopefully Beals will only utilize him in that role if he is effective. Dezse throws hard, but had several epic meltdowns as a freshman, including one in the Big Ten Tournament that essentially was the death knell for the season. Fathalikani and Armstrong posted much better statistics with much less flash in situational roles that they figure to reprise. Another freshman sidearmer, Trace Dempsey, is expected to get significant relief innings. Other pitchers on the roster include senior Paul Guey (who got some mopup work in 2011), junior Tito Nava (a transfer from Duke), and freshmen Matt Panek, Robert Sakowsky, and Sam Shafer (all except Panek are right-handed). Tyler Giannonatti, another junior eligible transfer from Gilbert-Chandler CC who may have figured in the relief mix, was lost for the season to injury. My primary interest in watching this season is continuing to learn more about Greg Beals and his philosophy. Beals did not impress me with his tactics in his first season, but while ideally the coach would be someone whose approach to the game I can embrace, the ultimate test is whether he can build a winning program. Even two seasons is far too soon to begin to form a judgment about that, so my focus will be on his game-level decisions rather than his program-building decisions. The Buckeyes open the season Friday-Sunday with the Big Ten/Big East Challenge in the Tampa Bay area. The following weekend they travel to Atlanta for a three game series at Georgia Tech. The first weekend in March will see OSU in Port Charlotte, Florida for the Snowbird Classic, which includes a non-conference tussle with the forces of evil, who are one of two Big Ten opponents not on the conference schedule (the other is Iowa). Then OSU goes to Myrtle Beach for the Coastal Carolina tournament. In a departure from past seasons, the Coastal Carolina tournament (which concludes March 11) will be an early conclusion to the typical Southern swing, as the Buckeyes play their home opening series March 16-18 against Austin Peay. The optimistic scheduling of March baseball in Ohio is made possible by the installation of FieldTurf in Bill Davis Stadium, which itself was made possible by a generous donation from OSU’s most notable recent big leaguer, Nick Swisher. The new Nick Swisher Field may not be aesthetically pleasing to purists, but given the harsh conditions of spring baseball in the North, it makes sound business and baseball sense to play on the fake stuff. Midweek opponents include Ohio University, Akron, Xavier, Cincinnati, Bowling Green, and Youngstown State at home, with trips to Louisville, Dayton, Miami, and Oklahoma State (two games in a return of a 2011 series in Columbus). Big Ten opponents are, in order: Purdue, @Michigan State, Minnesota, Nebraska, @Illinois, @Penn State, Northwester, and @Indiana. Thanks to the new eleven team Big Ten alignment (plus Nebraska, still without baseball at the joke of an institution in Madison), OSU will be off from Big Ten play on the weekend of May 11-13. That creates an unusual five game stretch of non-conference games (the trip to Oklahoma State and a three game weekend home series against Seattle) in the heart of the Big Ten schedule. If OSU qualifies for the Big Ten Tournament, it will once again be played in friendly territory, at the Clippers’ Huntington Park from May 23-26. I always find it difficult to make a prognostication for the season, as my knowledge is limited to just the Buckeyes and does not extend to the conference opponents. I can only go based on the general standard of the Big Ten and how a given year’s OSU team compares to previous ones. On that basis, I think OSU is probably about as good or better as they were in 2011. But when you go 13-11 in a bunched conference and have a below .500 record, and the season is so short, what does that really tell you? I think OSU should qualify for the Big Ten Tournament, but contending for the regular season title is probably not in the cards. The coaches’ preseason poll ranks Ohio 5th which seems reasonable. Note: I do not have any inside information--details that are not obvious have either come from my supposition as a long-time follower of the program, the information published on the official athletics website, or the B1G Baseball blog.